Seven Surrey players have signed new contracts with the club. 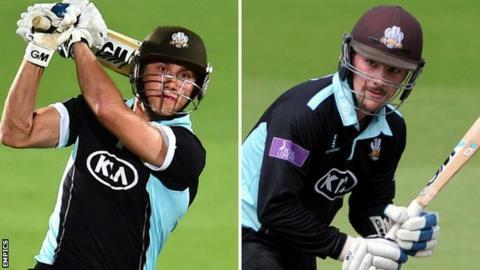 Zafar Ansari, Rory Burns, Tom Curran and Dominic Sibley have all signed three-year deals, which will keep them at the club until the end of 2017. Meanwhile Gary Wilson, Stuart Meaker and Gareth Batty have agreed two-year contracts which will run until the end of the 2016 campaign. "We now have an exciting blend of home grown talent and experience," director of cricket Alec Stewart said. Ansari, 22, and Burns, 24, both scored over 900 runs at an average above 40 in the County Championship this season while fast bowler Meaker, 25, and experienced spinner Batty, 36, took 32 and 39 wickets respectively. Curran took 16 wickets in six Championship appearances but fellow 19-year-old Sibley failed to replicate the form which made him the youngest double-centurion in County Championship history, scoring a total of 79 runs in eight innings. Wicketkeeper-batsman Wilson, 28, captained the side in 2014, which he described as "challenging but a huge honour". Surrey missed out on promotion from Division Two this season, eventually finishing fifth in the table. "In the middle of the season it really looked like we were really going to push for promotion and even claim first spot so it was very disappointing not to finish up there in the end," Wilson told BBC London 94.9. "We spoke at length after the last game and said that whilst this year has been about making progress, we need to make no mistake that next year is all getting promotion back to Division One. "We need to be more ruthless when we have got teams under pressure." Steven Davies, Arun Harinath, Tim Linley and Vikram Solanki are all under contract until the end of the 2015 season.